I have been very good this semester at bringing my lunch to school (or eating at home). It’s not that hard because there are very few appealing options at school (Carl’s Jr? No thanks!) Today I had a lot of reading to do in the morning and I didn’t have time to make lunch. After class I decided to wander over to the area where the food trucks congregate and boy am I glad I did. 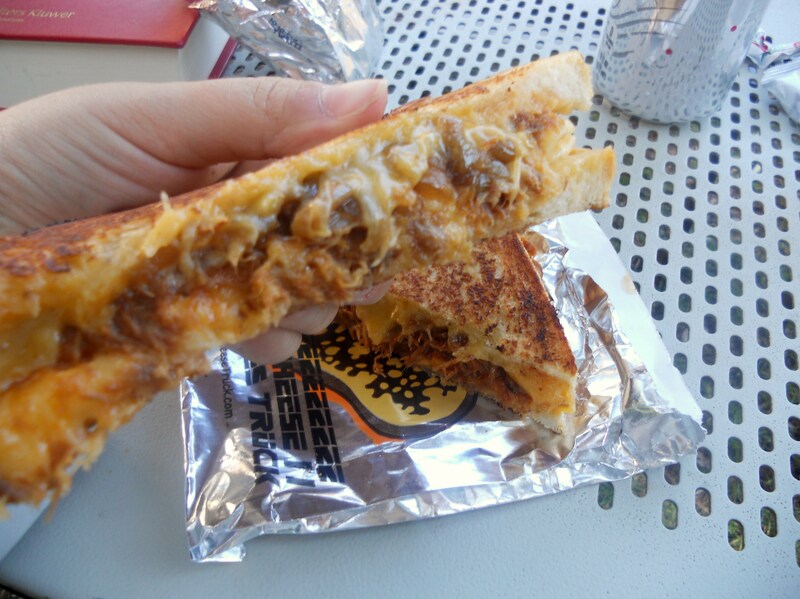 I’ve been wanting to try the grilled cheese truck for a long time. The line for the grilled cheese truck is infamously long. It took about an hour between ordering and waiting but it was so worth it. On the plus side I had plenty of time to plan what I wanted to eat. While I was enticed by the brie and fig melt (!) 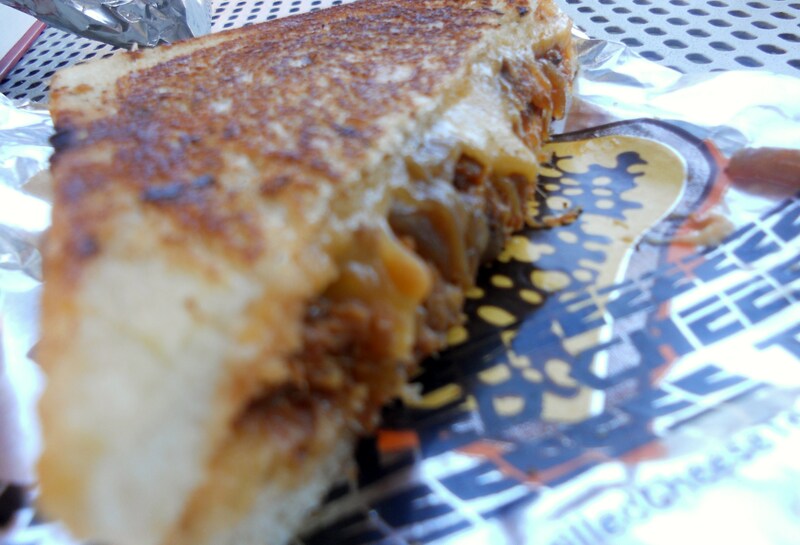 I decided to go with the signature sandwich: the mac and cheese melt with rib meat and caramelized onions. This sandwich is what it sounds like: cheesy mac and cheese with rib meat. It was pretty tasty but very heavy. Not only was the mac and cheese cheesy, but there was additional cheese. So much cheese. I’m not complaining, we all know that I love cheese. You’d think that eating a sandwich with pasta in it would be weird but the mac was very soft, it didn’t seem like I was eating pasta at all. The rib meat was shredded and had a sauce which was slightly tangy. It didn’t over power the cheese but it cut the super cheesiness. In my opinion the mark of a good grilled cheese sandwich is the bread and how it is cooked. This bread was perfection. Not over cooked but buttery and crisp to offset the cheesy center. This sandwich makes me never want to buy grilled cheese from anywhere else ever again (except Clementine). I also ordered a half order of tots on the side. I can’t help myself. I am weak before the prospect of tots. 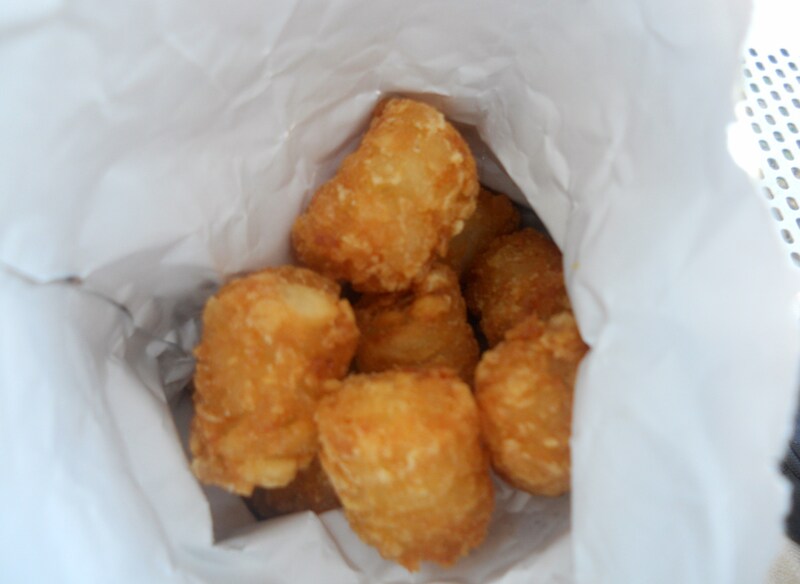 In my opinion, nothing will ever trump Umami’s cheesy tots but these did the trick. I had a massive cheesy food baby after finishing this meal. In fact my food baby almost put me to sleep in remedies. I fought through it and went on a 4 mile run after school. It should be noted that grilled cheese and tots are not proper fuel for runners. The second half was faster that the first half which is always good but my stomach was kinda queasy the entire time. 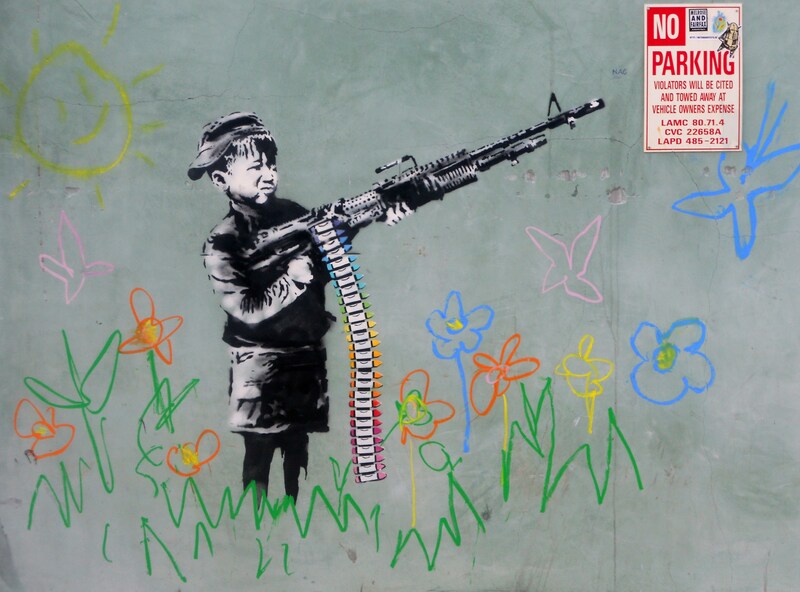 And finally: The street artist Banksy has been in LA recently. “Through the Gift Shop”, his documentary, is nominated for an Oscar and is fantastic! I saw it when my brother visited me last summer and thoroughly enjoyed it. You should see it if you haven’t already. While Banksy has been in LA his work has been cropping up in the city. Some was spotted on Sunset but one popped up in Westwood! This is pretty cool because no offense to this corner of the city, but it’s not really all that hip. I’d expect to see Banksy’s work in Hollywood or Echo Park but not Westwood. Of course, I expect it will be gone shortly so I stopped by this afternoon to snap some photos. It’s in Westwood on Kinross between Westwood and Glendon (behind Urban Outfitters) but hurry up if you want to see it, I hear they’re trying to paper it over already! 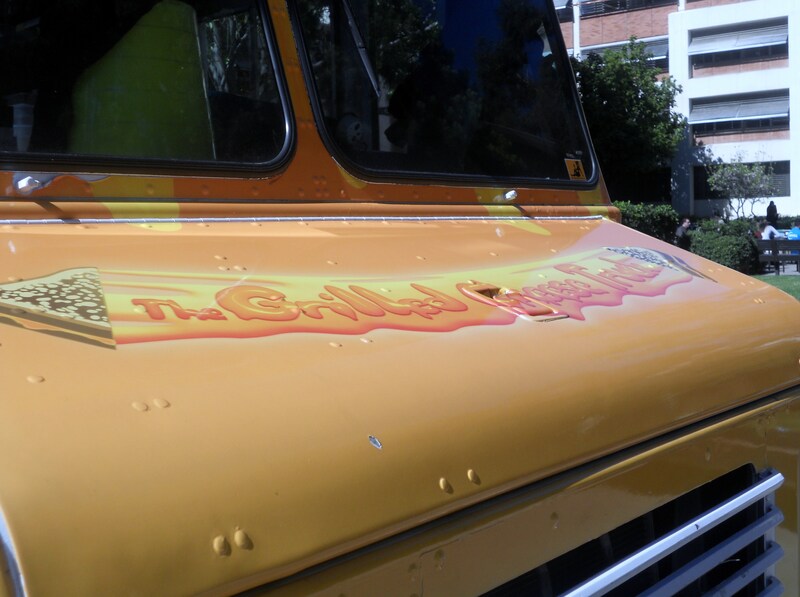 The grilled cheese truck was an awesome truck. Do you have an idea for a great truck? I think a macaroon truck would be pretty sweet (salted caramel from Tavern obvi) or a Susie Cakes truck, OR maybe a bacon truck. Oh I wish that we had food trucks where I live! We only have taco trucks that I’m not really too interested in trying. And it’s funny that you should mention a bacon truck, my sister went to a food truck today called Bacon Mania! Looks good and totally jealous! Holy hell that looks good! 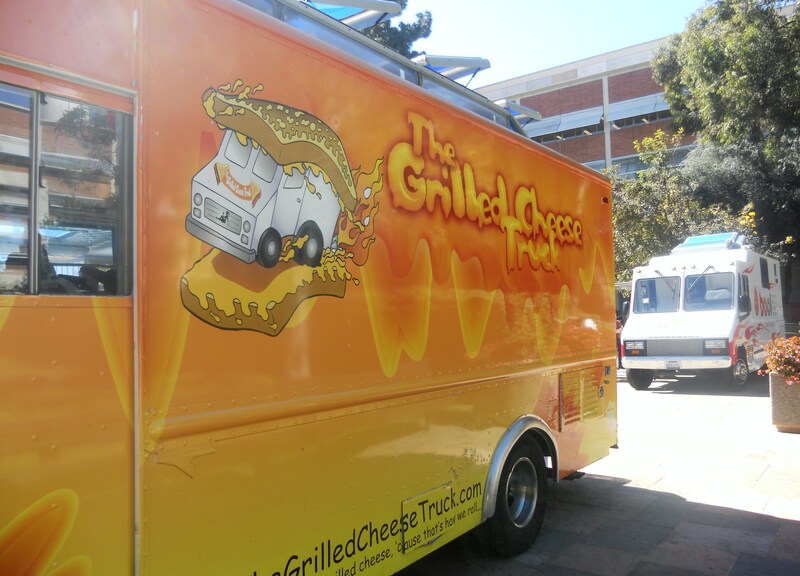 I am kind of obsessed with grilled cheese- I need to seek out that truck immediately! Major props for going for a run after that. I tried to run once after I ate out and I had to stop after half a mile and dry heaved into the bushes for a while. My sister happened to drive by and mercifully drove me back home. NEVER AGAIN! i stood on line for the truck once last summer but never made it to the end; left after 15. i blogged about exit thru the gift shop today too!! That’s so cool! I want to go try to see the banksy work this weekend. I hope it’s still there when i go. 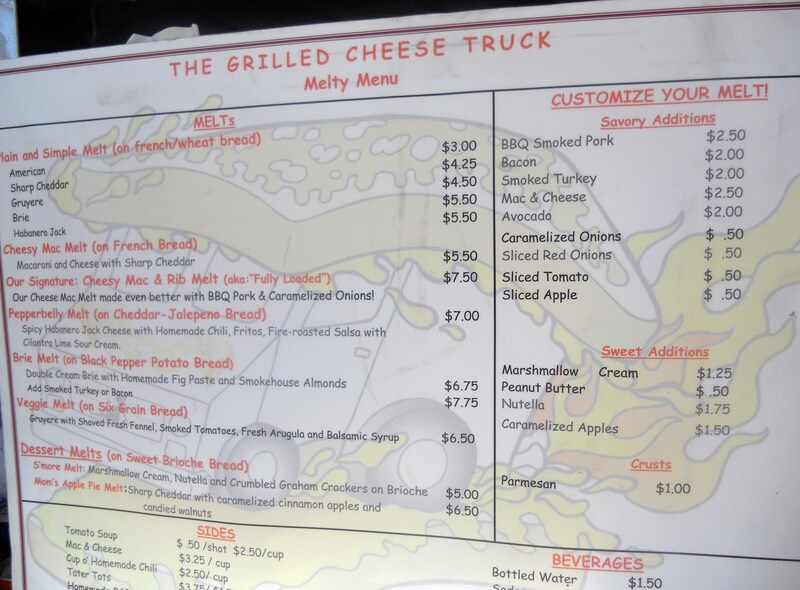 I’ve been wanting to try the grilled cheese truck also, but if the wait’s an hour long I don’t know if I really want to! 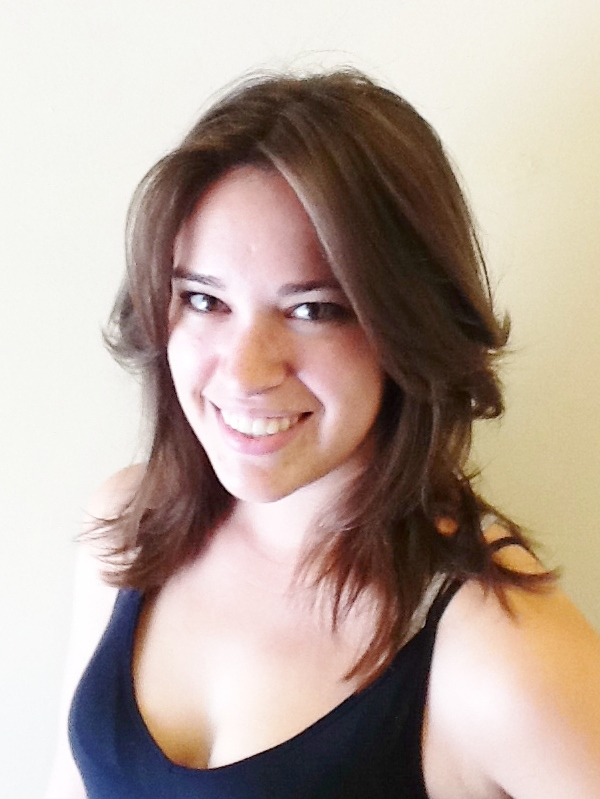 Also – you go to ucla right? There’s a carl’s jr there? I don’t think it was there when I was a student there – almost 10 years ago =( I can’t believe it’s been that long already. Oh yes, Ackerman is totally full of fast food restaurants including rubios, carls jr, taco bell, panda express, and more that I can’t remember. There are “heath” places, but they aren’t really anything to write home about. Hope the Banksy is still there! I want to try this truck so badly but I am 100% convinced it would give me a stomach ache. I may just have to live vicariously through you! Major props for running 4 miles after eating that, though. I for sure would have just called it a day! 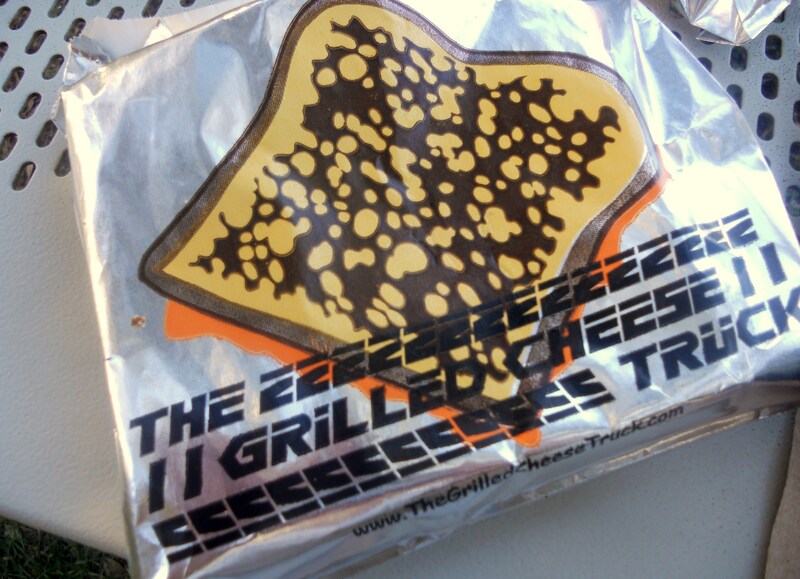 I reallly love the Grilled Cheese truck so much. I’ve only had the one with the mac & cheese but I want to try others! I am so envious that you got to see Bansky’s work up close and personal!!! PBJ’s is just WRONG they are so awesome!!!! hah! i heard about those paintings on the news last night! i heard a guy actually cut a charlie brown one out of the wall of a burnt building! crazy! 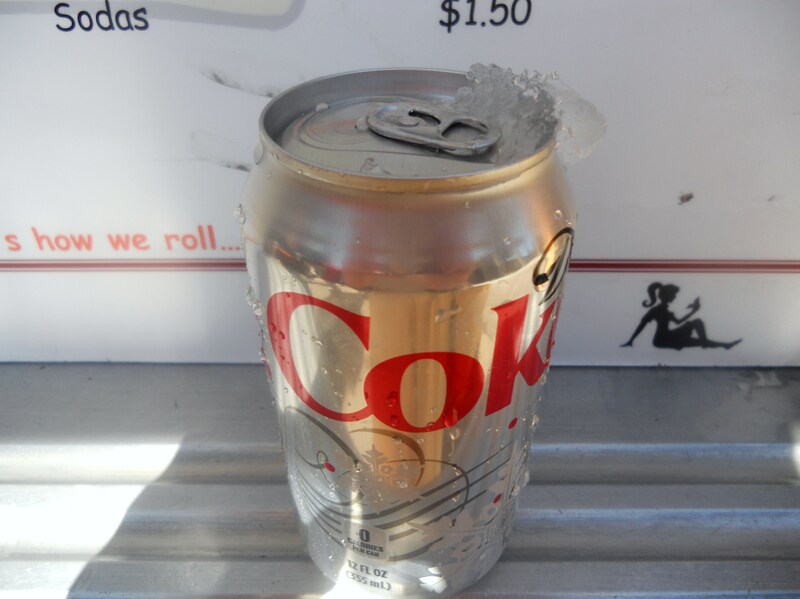 I love the concept of food trucks, but I am such a baby and cannot bring myself to wait. I want to so bad, believe me, but I am one of those people that want to eat right away the second I am hungry. My dream food truck would be pancake burritos – you heard that. You know a pancake as a tortilla with various other breakfast items as the filling. And then the main rule of the truck, no lines!